You will agree with me that in the fight Nest vs Honeywell, thermostat NEST has more chances? But let’s watch the details! While the Nest is considered the best Smart thermostat, the lesser known Honeywell offers almost the same performance and costs much less. So, there’s this dilemma most homeowners face; go for Nest at around $250 or save around $80 with Honeywell. Nest Learning vs. Honeywell RTH9580WF; what’s the Best Choice? In this article, we are going to help you make the best choice between the two. So, without wasting any more time, here is Nest vs Honeywell comparison table. Nest Learning 3rd Gen is among the best Smart thermostats in the market. Since its inception, it has dominated the market together with Ecobee4. This Smart thermostat features a compact circular design with a more advanced high-res LCD. This LCD lights up when you approach it courtesy of Farsight allowing you to easily read the temperature. Even though it lacks remote sensors, you can trust its accuracy when it comes to measuring temperature and adjusting your HVAC. 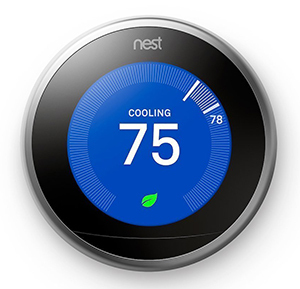 The most notable feature in this thermostat is the Learning function and hence the name Nest Learning. It uses history to learn your lifestyle by noting the temperatures you set over time. Thereafter, it will start adjusting to these temperatures automatically. Another great feature of this thermostat is the motion tracking sensors that detect whether you are home or not. This feature saves energy by adjusting the mode to ‘Away’ which shuts down almost all the HVAC systems. What I liked about Nest is Leaf. This is a feature that alerts you whenever you are in the perfect temperature settings, or rather peak performance. Besides, Nest offers great reports on energy usage, areas where you need improvement and other customized data. In addition to this, it notifies you whenever your HVAC has a malfunction or when you need to change filters. This thermostat is compatible with Alexa. However, it doesn’t work with Apple HomeKit, a very popular Home assistant. This is another superb Smart thermostat that you can go for if you are not okay with the almost $250 price tag Nest Learning attracts. It sports a larger touchscreen LCD that displays more information including temperature setting, humidity, time, date and the status. Unlike Nest that has Smart Learning, this thermostat is only programmable. It can be scheduled for 7 straight days thus giving you the freedom to concentrate on other things apart from your HVAC system and home comfort. With this thermostat, you can control and monitor your HVAC system remotely on the Smartphone App. You also get to receive notifications whenever there is a sudden temperature change, in case your HVAC system malfunctions or when it’s time to change your filters. For those working towards a Smart Home, this thermostat will come in handy as it is compatible with Alexa. If you are looking for some freebies, make sure you enter your Zip code and postal code here to see if you qualify for a rebate. In this segment, we are going to see how these two thermostats compare by looking at several important aspects about Smart thermostats. That said, let’s get straight to business. The first difference you will note between these two Smart thermostats is the design. While Nest sports a circular design, Honeywell has a rather sleek rectangular design. One thing you will like about Nest is the sleek, stylish and compact design measuring 3.3 x 1.2 x 3.3 inches and weighing just 1 lb. Compared to Honeywell, Nest doesn’t require a large space to install. On the other hand, Honeywell is larger for a reason. First, it has a larger LCD that displays more data than Nest. While Nest displays temperature only, Honeywell displays the temperature setting, humidity, mode, and even date and time. Besides, this LCD panel has more color options than what you will find in Nest. Perhaps what brings the difference between these two is the fact that Honeywell’s LCD is touchscreen enabled while Nest’s isn’t. When it comes to design, the winner is ultimately Honeywell courtesy of its touchscreen display and wide color options. The compatibility of these two Smart thermostats is another important talking point. Even though both thermostats are compatible with North American heating and cooling systems, there are a few vital points to note. First, even though Honeywell can be used with heating, cooling and heat pumps, it is not compatible with pumps that have electric baseboard heat of 120-240 volts. On the other hand, Nest Learning is not compatible with millivolt systems and not line voltage. Also, even though it is recommended for low voltage systems, there are exceptions. These exceptions include wired remote sensors, proprietary systems, pumps with L wires, and three-stage cooling. If you are not skilled enough in HVAC systems, just open the back of the thermostat and use these two compatibility test tools; Honeywell HVAC compatibility test tool and Nest Learning compatibility test tool. Regarding compatibility, none of these two is a worthy winner. However, Honeywell is a better choice; unlike Nest, it doesn’t have many limitations. How easy or hard is it to install your thermostat? In my opinion, none of these two Smart thermostats offer easy installation as they all require C wires. This is among the reasons I recommend the Ecobee3 because it comes with a Power Extender Kit so you won’t need the C wire. For me, I am greatly skilled in HVAC systems so it wasn’t a problem to install any of these two thermostats. However, for beginners, it is not a straightforward DIY as promised. However, if you don’t have a C wire, there are a couple of workarounds that I won’t guarantee that they will work on all HVAC installations. With Nest, the only hurdle with installing this thermostat is connecting the wires otherwise setting up the thermostat and adding your Nest account is very easy. If you follow the detailed Nest installation procedure, you will be set in an average of 20 minutes. When it comes to Honeywell, the C wire is required too. However, the biggest challenge will be determining connecting the wires. I feel it is easier with Honeywell than Nest because the connections are well labeled, in fact, with colors too. Here is a resourceful read on the Honeywell installation procedure. When it comes to ease of installation, I would recommend Nest because you can easily use it without the C wire by tapping Wi-Fi power from the D and G wire. 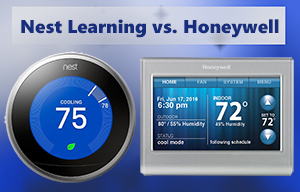 Which of these two thermostats is easier to use, Nest or Honeywell? Nest Learning 3rd Gen comes with a more advanced LCD compared to what you find in the Nest Learning 2nd Gen. It has better resolution and doesn’t fade easily. This thermostat also offers App Smartphone control. Besides, Nest is compatible with Amazon Alexa. On the other hand, Honeywell packs a larger LCD that is in fact touch screen enabled. In addition to this, it displays more data so you are able to see a lot of information on the main screen. Just like Nest, it has Wi-Fi for Smartphone App operation. Here, Honeywell carries the day courtesy of the larger and more intuitive LCD that is also touch screen enabled. As a Smart device, these two thermostats have different Smart approaches. While Nest has Learning function, Honeywell has 7-day scheduling. With the Nest Learning, the system will slowly learn your temperature setting pattern and thereafter do the adjustments automatically. This is what is called the Learning function. Besides this, it has been equipped with Leaf, a feature that alerts homeowners when they are at peak performance. On the other hand, Honeywell uses a completely different approach. Instead of the Learning feature, it comes with a 7-day programmable schedule. 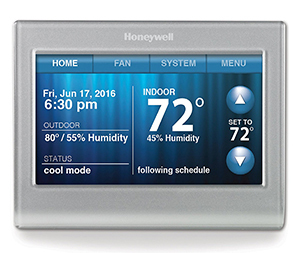 This allows homeowners to set their temperatures for the entire week and Honeywell will automatically be adjusting itself depending on the set temperature. In terms of intelligence, Nest remains the favorite because once it learns your lifestyle, you don’t have to worry about managing your HVAC anymore; it does everything. What happens when there’s an important notification regarding your HVAC system? Nest has a reporting system that will send a notification to the connected device. For example, when your HVAC system malfunctions or when it needs parts replacement, Nest will send a notification to the Smartphone App. Besides, it gives you a range of reports regarding your energy usage, areas you need to improve and also, the best temperature settings that save energy. On the other hand, Honeywell also has reporting feature but is not as advanced as the Nest’s reporting. It will only notify you of the basics; extreme temperature fluctuations and filter change reminders. From the fact that Nest gives tailored reports with additional information, it is the ultimate winner when it comes to reporting and notifications. Even though they offer comfortable temperature settings in the house, the primary reason for installing thermostats is to save energy. Nest learning saves 10% – 12% on heating costs and 15% on cooling. Based on the average energy costs, this saves you around $135 – $145 every year. This is based on the research of two independent bodies. One important thing to note about the 3rd Gen Nest Learning is that it is the first Smart thermostat to be rated Energy STAR certified by EPA. On the other hand, Honeywell will save you around 10% on heating costs and around 13% on cooling. This translates to around $100 every year which is very commendable. From these statistics, it is evident that the thermostat will have repaid itself in just two years. In terms of energy saving, the 3rd Gen Nest Learning is undoubtedly the winner. Most Smart thermostats depend on power from the mains. But what about when there’s a power outage? This is where the Nest comes in handy. Unlike most Smart thermostats, it is wired and still packs an inbuilt battery. This helps it save data that would have otherwise been lost with purely wired thermostats. On its side, Honeywell is only wired so you can’t trust it when power is lost. Here, Nest is the best choice because you can never lose data or any settings when there is a power outage. These two thermostats have a huge price difference. Nest costs $235 – $245 depending on the color choice. The stainless steel variation costs $10 more. On the other hand, Honeywell will cost you anything in the range of $180. Please note that these prices are subject to change. When it comes to price, Honeywell carries the day as it is cheaper and more affordable. On many HVAC forums and blogs, this has remained a pertinent debate that is not going to end soon. There are those who believe Nest is the best while others maintain that Honeywell is a better and more affordable option. Having looked at the features and what each of them offers, the decision rest in your hands. However, we will give you a piece of our mind. 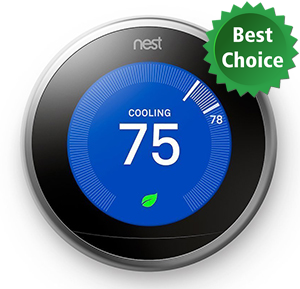 If you really want to save energy costs greatly, then we highly recommend Nest Learning. It can reduce energy costs by over $130 annually. This is very impressive compared to Honeywell that saves around $100 annually. However, if you are on a budget and you don’t want to spend the $250 for Nest, Honeywell is still a better bargain. Retailing at around $180, it will still save you a few bucks every month. Having said that, it’s time you make up your mind on which is the best Smart thermostat between Nest Learning and Honeywell RTH9580WF. Get any of these two Smart thermostats and start cutting down your energy bills. In two years, you will have already gotten back your initial investment!